Super Hero Boy: My first giveaway! UPDATE!! We have a winner by random drawing. Karla send me your address!! I'm really enjoying blogging and I've met some great new friends. During the Fall Ya'll giveaway I won a copy of Picture Book Preschool from Sherry at Semicolon. 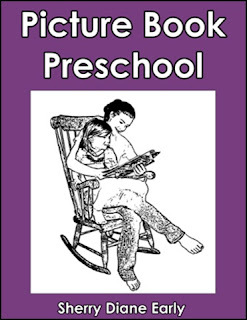 Picture Book Preschool is a preschool curriculum presented week by week to build values and teach lessons in preschoolers. It would be a GREAT resource for any homeschoolers out there or mom's with preschool kids who want to start kindergarden prep. If you don't win and would like to buy a copy of it. You may do so here. Its $12.99 which is really a bargain! I won this for Connor and debated on keeping it but since he is still a bit too young I've decided to share some of my recent winnings! Post a comment to win. Link to my contest on your blog and I will give you another entry! I will keep this contest open until Nov 23rd at midnight (central)! I will announce the winner via random drawing no later than Nov 26th. Please count me in! Looks like an excellent resource! I am so excited I won! Thank you so much!